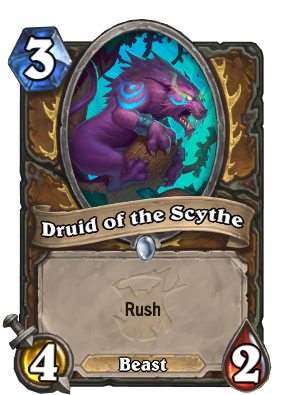 A new druid card has been revealed by RenieHouR. Follow us on Twitter to get notified of new cards immediately! Looking to learn more about Hearthstone's eighth expansion? Visit our expansion guide for The Witchwood!! A pretty solid card. 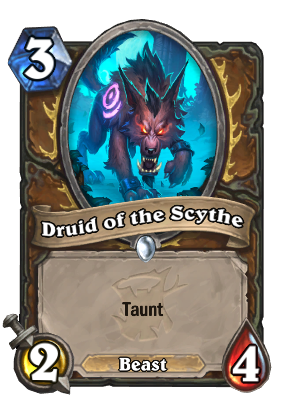 4 damage to a minion for 3 is an OK price, and Druid often lacks good removal. 2/4 taunt isn't too big, but it can do it's job. While Squirming Tentacle has almost never been played (Kibler put it into a few Handbuff paladin decks, but it's Kibler...), and Shadow Bolt hasn't been seen in a long while (though it has seen play in the past), this is both of them in a single card. Flexibility, as we've seen, is valuable. Is it just me or does the art for the two forms seem backwards? Though, the fact that they are both cat forms doesn't make as much sense. I guess that makes a little more sense... still don't like it but hey, what can you do. To Paraphrase a quote from Genn Greymane in HOTS: "Of course the scythe is just for show." From the preview we were given I was expecting this to be another Elise so I'm very disappointed. The flavor is a little bit poor: It appears to be a druid wielding the balance druid (moonkin) artifact weapon, but its effect is feral transformations. 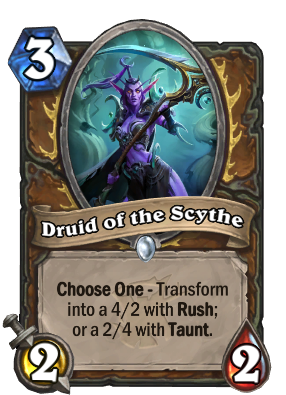 druid of the arena am I right?